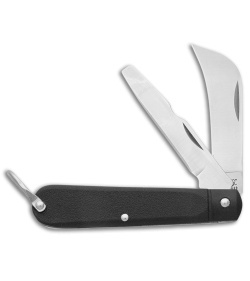 The Bear and Son Electrician features a solid slip joint design for convenient everyday carry. It has two blades, a hawkbill and a screwdriver tip blade with a wire stripper. Black Delrin handles with nickel silver bolster and bail finish off the excellent design.